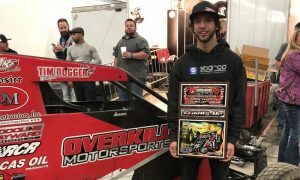 TULSA, Okla. – Rarely in recent years have B-Main transfers had a shot to contend for the win in the 55-lap Lucas Oil Chili Bowl Nationals finale, but don’t tell that to California’s Ryan Bernal. He started from the final row on the grid and charged inside the top five by the end of the show. Bernal ran into the big dance as the sixth and final transfer from the first B-Feature of Saturday night’s championship program, started 23rd in the 24-car field and methodically picked off one car after another in his No. 87 NOS Energy Spike/Stanton-SR11 for Clauson-Marshall Racing. 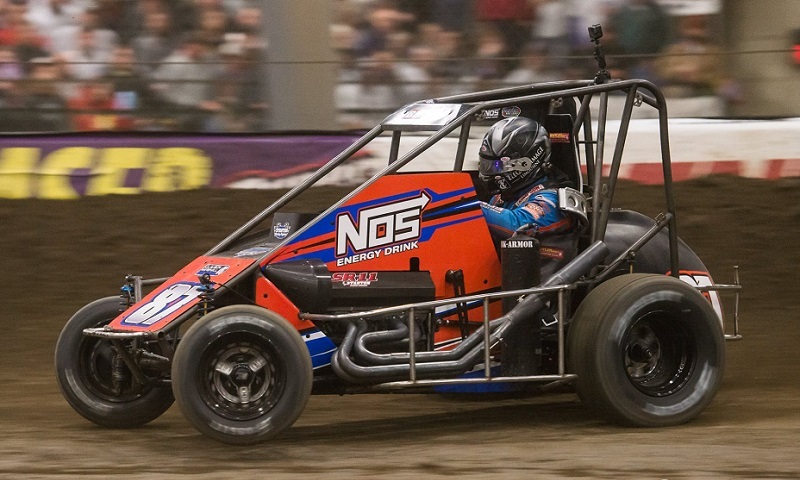 The 24-year-old ultimately crossed the final checkered flag in fifth, finishing as the highest-running Clauson-Marshall entry as well as the highest car not wrenched by one of the two Kunz brothers. For Bernal, whose main career is that of a firefighter after attending the San Jose Fire Academy in 2016, the run was certainly a memorable one. Bernal stressed that if a late caution had flown, he felt like he could have broken up the Keith Kunz/Curb-Agajanian Motorsports sweep of the podium. Bernal’s net gain of 18 positions netted him hard charger honors for the A-Feature. While Bernal advanced the most positions in the main event, another driver who made a hefty charge and threatened to challenge for the win was Nevada’s Tanner Thorson. Thorson had to win his C-Feature and come from 15th to third in the first B-Feature in order to make the big dance for the fourth-straight year. Once he got there, though, the Dooling-Hayward/RCR driver went on a tear. Thorson found the top 10 on lap 16, was seventh on lap 22 and finally cracked the top five after a restart with 33 complete. He picked up one more position in the final laps to come home fourth, trailing only the Keith Kunz entries of winner Christopher Bell, Rico Abreu and Spencer Bayston. “The run we went on is nothing to hang our heads about … it’s nothing to be too upset over, for sure,” said Thorson, who drove for Kunz last year before switching to Dooling-Hayward during the offseason. Thorson’s effort again ties his career-best Chili Bowl A-Main finish. The 21-year-old finished fourth in the 2015 and 2017 Chili Bowls in addition to this year’s running. He also won the C for the second year in a row. For his efforts, Thorson was recognized by the RacinBoys Broadcasting Network as the overall Jason Leffler “Elbows Up” Award winner for the week. Thorson also received the Donnie Ray Crawford Hard Charger Award for his week-long pass count, advancing 62 positions between his qualifying night (D-Feature to A-Feature) and championship night (C-Feature to A-Feature). 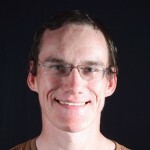 Jacob Seelman is the Managing Editor of Race Chaser Online and creator of the Motorsports Madness radio show, airing at 7 p.m. Eastern every Monday on the Performance Motorsports Network. Seelman grew up in the sport, watching his grandparents co-own the RaDiUs Motorsports NASCAR Cup Series team in the 1990s. The 24-year-old is currently studying Broadcast Journalism at Winthrop University in Rock Hill, S.C., and is also serving as the full-time tour announcer for the Must See Racing Sprint Car Series.